A decade ago, West Virginia was set to receive millions in a prescription drug settlement from the maker of OxyContin. Then-governor Joe Manchin vowed the funding would help his state win the "drug war once and for all." Behind the scenes, however, Manchin was trying to secure a personal "Governor's Helicopter" with the funding, at a time when opioid deaths were climbing to the highest rate in the nation. Manchin's request of $3 million for the helicopter raised a "RED FLAG" from the head of West Virginia's criminal justice programs, according to an internal memo obtained by the Washington Free Beacon. Manchin, who served as governor from 2004 until 2010, was taking "the lead" on how to spend the $44 million settlement from Purdue Pharma for its misleading claims about the addictiveness of OxyContin. The governor wanted to "think out of the box a little bit" on how to spend the settlement money. "We may want to put forth a good, detailed plan to satisfy those areas [of prevention, awareness, education] but we may be wanting to think out of the box a little bit," said Joe Thornton, Manchin's cabinet secretary for military affairs and public safety. Thornton's comments came in September 2007 just as the state was about to receive its first payment, according to the Charleston Daily Mail. "The governor's office has a keen focus on this being spent in the law enforcement arena in these specific areas and knows what a dent this can put in our drug enforcement efforts throughout the state," Thornton said. A month earlier, Manchin's administration was busy coming up with ways to spend the settlement funding. A memo circulated by Carte Goodwin, Manchin's chief counsel who he later appointed to fill the vacant seat left by Robert Byrd, included numerous proposed projects. One request came from Manchin himself, marked, "Governor's Helicopter." "Governor wants settlement funding dedicated to purchase a new helicopter," the memo states. "This request needs not only to determine the ability to fund, but under what circumstances would a helicopter be allowed under the stipulations of the settlement. Call me if you have questions or this doesn't make sense. $3 million." Thornton sent the proposed projects list to J. Norbert Federspiel, the director of the Division of Criminal Justice Services. Federspiel said he reviewed the list at the end of July with the U.S. attorney's office and made observations on which items would likely be approved for law enforcement purposes. Manchin's request for a personal helicopter received a "RED FLAG." "First off it cannot be the Governor's Helicopter," the note reads. Federspiel dismissed the idea of a personal helicopter and expressed skepticism that the $3 million cost could be justified as combating illegal drug use if Manchin used the helicopter at all. "If it is used predominantly by State Police for law enforcement activities, it is probably justifiable," he said. "Assurances and documentation of usage for law enforcement purposes would be a must. I don't know what percentage of use the Governor could make of such a thing, but at very least I'm sure that [West Virginia State Police] WVSP would need to us [sic] it the majority of time in order to fly." "State police would have to document their need for the bird," Federspiel added. "Beware of public perception and awareness." Evidence suggests Manchin's office heeded that advice. However, Manchin's preference for how to spend prescription drug settlement money could complicate his reelection efforts in a state with the highest rates of opioid-related deaths in the nation and challenge the Democrat's campaign claim that he fought to "ensure that there is funding for substance use disorder treatment." 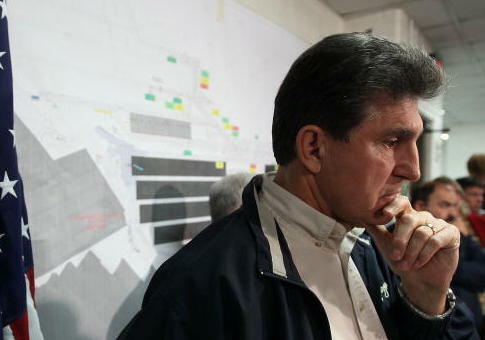 By October 2007 Manchin's office still did not have a final plan on how to spend the funding. Just a few months later, Manchin was touting the settlement in his state of the state speech in January 2008 as a way to win the drug war. "And for the future health of all of our citizens, we must continue our war on illegal drugs in West Virginia," Manchin said. "In the past, we have committed extra money to this effort, but this year, due to the hard work of our State Police as part of an investigation led by federal prosecutors, we will be receiving over $44 million to help combat our state's drug problem." "And I believe that within the spending guidelines and requirements given to us by the federal government, we can make tremendous strides toward winning our drug war once and for all," Manchin said. Opioid-related deaths nearly doubled during Manchin's tenure as governor. In 2004, the year he was elected, there were 275 opioid overdoses in West Virginia. By 2010, the number jumped to 499. Controversy over Manchin's handling of substance abuse funding was not limited to personal helicopters. Two years after the settlement, Manchin came under fire from fellow Democrats for failing to follow through on his own promises to increase funding. In November 2009, Manchin released a strategic plan to address substance abuse, which called for spending an additional $23.5 million on prevention, treatment, and recovery programs. "It is time that we took seriously the business of reducing substance abuse," Manchin said. "We cannot afford not to." When Manchin released his budget in February 2010, however, he did not include his own recommendation for increased substance-abuse funding. The Charleston Gazette quoted a Manchin spokesperson as saying the state's budget situation had "changed dramatically" since the report. Democrat state legislator Don Perdue criticized Manchin for not making substance abuse services a "funding priority" and for not deploying millions in unused Medicaid funds to address the problem. "Despite the fact that our state has a half-billion dollars in the rainy day fund and a $350 million surplus in Medicaid by the end of the budget year, you have apparently decided this pressing need is now not a funding priority," Perdue said. Manchin said it would be "ill-advised" to use the surplus funding and defended his administration as spending enough. "It would be different if we put forward zero, or we've identified a big need that we haven't done anything about, but that's not the case," Manchin said. "They're trying to make it look as if we haven't done anything. "For some people, enough is never enough," he said. The fatal drug overdose rate of 52 per 100,000 in West Virginia is nearly three times the national average. This entry was posted in Politics and tagged 2018 Election, Drugs, Joe Manchin, Opioids, West Virginia. Bookmark the permalink.